When I began mulling over the idea for this blog, I knew the first person I'd want to feature in a "meet the collector" posts was my dear friend, Anna. She has such a fantastic eye for art and design, and is so thoughtful in all of her choices, I knew she'd make for a great first interview. Who/what inspired you to start collecting art? I can't say that one thing in particular inspired me to collect art. I've always loved anything art- and design-related and was drawn to both at a very young age. As I matured, went to school, and traveled, my desire to collect has continued to grown and seems to be ever changing! What was the first piece of your collection? Well, the first piece I ever bought was from an antique shop in Harper's Ferry. It is called The Proper Measure of a Man by R. Nielsen and is from the 1970's. Out of what's hanging in my home now, though, the first piece is something I drew in art class when I studied abroad in Paris. A print of Morgan Fink's Abstract Landscape III that I bought at the Larkin Arts Gallery in Harrisonburg, VA. She is an artist local to that area. Over the last few years, my husband and I have grown to love Shenandoah. We do a lot of biking, camping and trail running down there and bought Abstract Landscape III in the area at Larkin Arts Gallery. Morgan Fink's style is beautiful and not your average landscape. The expressionistic color and linework is what drew us to the piece, and with the meaning behind it, I am sure it is something we will have forever. At what point did you feel like an art collector? I am not sure I feel like an art collector yet! But, I started to feel more confident with my collection about three years ago. 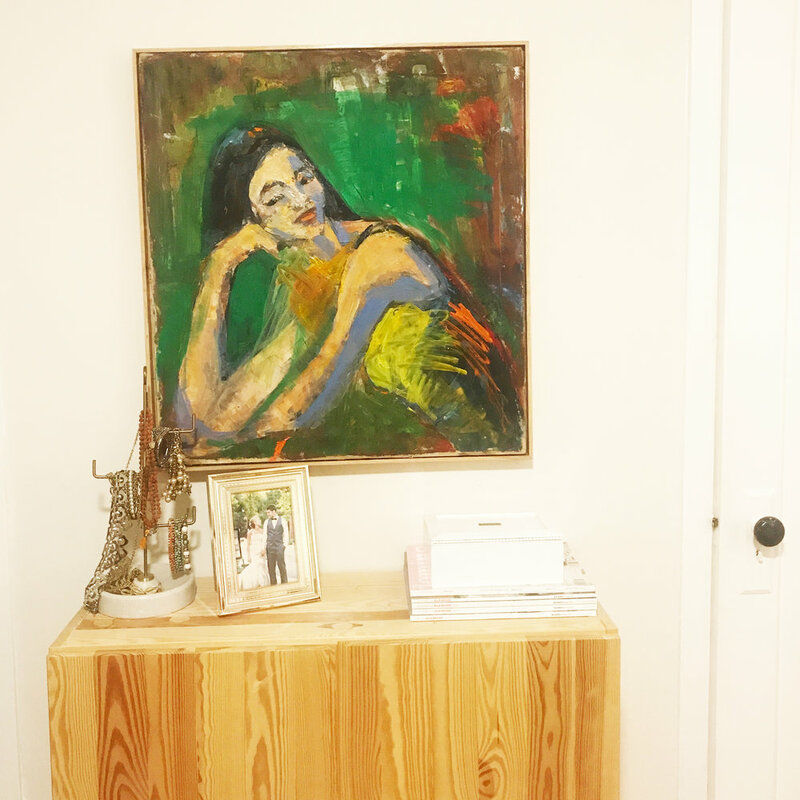 What do you look for when you purchase art? Uniqueness, expressionistic brush strokes, sketchy lines. I've always been drawn to imperfection in art. I'm not really into photorealistic art. It doesn't feel natural to me, and maybe because I have pretty eclectic taste, I like that "imperfect art" leaves room for interpretation and allows me to more easily adapt my design style with it, especially when I know my style is evolving and maturing. was from a local artist helped! It isn't my usual go-to colors but I loved his cubist approach to the portrait, especially the eyelashes and hat. I studied abroad in Paris and adored the little node to the Eiffel tower without being overly cliche or cheesy. In a different house, I imagine this piece over a chest that is either incredibly modern and clean lined or weathered and simple. What advice do you have for other young collectors? DO NOT RUSH. When I first got out of college, I really wanted to "feel the part" of being a newly graduated designer. Quite frankly, I still want to feel that. I've made some art purchases that I really do not like anymore because I just wanted to have something on the wall. I've slowed down since. Don't go on a mission to complete your art collection in a year. Who you are today is not who you will be in two years, five years, and so on. We are constantly growing and evolving, finding new interests, and our style evolves with that. Trying to have the perfect art collection all at once will likely leave you with a lot of regrets. Instead, focus on getting one or two really amazing pieces a year. Then your collection will be a natural progression and reflection of who you really are and you'll be less likely to regret pieces. If anything, you'll think of those pieces as mementos from that stage of your life. these Tribal Portraits. I love them. I've thought about rotating them to a new spot in my home, but I think they'll be pieces that will forever have a wow factor. They are just really special. What's your favorite place to discover great art? I've had some luck at Evolution Home in Alexandria and Etsy online. I love supporting local shops and emerging artists. What's something you don't imagine you'll ever have in your collection? One day I was "treasure hunting" in Old Town and stopped by Look Again. I will be honest, I was having no luck that day. I walked upstairs in hopes of finding something worthwhile. What, if anything, do you think is "missing" from your collection? I am itching to shake things up in my art. It's very saturated with color, and I want everything to just feel a little softer. Many of these pieces were purchased within a two-year period, and like I mentioned before, my style is shifting. I'd like some neutrals. Maybe quiet landscapes. I always love a good portrait but maybe it's not painted so visually heavy and instead is in charcoal or oil pastels. I just want to take everything down a notch. I live such a busy life and want to be in "retreat mode" when I come home! What was the piece that got away? There were some really great pieces at The Screendoor in Asheville, NC a few years ago. A couple of vintage portraits and landscapes. I should have snagged one, but I was being cheap and indecisive. We all have budgets. What's something you de-prioritize so you have extra funds for art? Clothing. I rarely buy new clothes. the same room with the photographs so it is a nice contrast in style, yet ties in with the other colors. You just got a surprise gift of $1000 to put towards your art collection. How would you use it? I would head straight to the Torpedo Factory and buy something local and something really special. All of my art is under $300 a piece, so I would look for something to put over my dresser (which has been bare for 5 years) to complete our bedroom. Can you recommend a local artist who deserves some love? Nicole Ida Fossi at Studio Gallery in DC makes some beautiful portraits and super unique botanical paintings. Collectors, want to share you wisdom and show off your favorite pieces? Shoot me a message via the Contact page, and I'll give you the details. I'm always looking for new and varied collectors to feature here!